This gorgeous, crisp white duvet set, with appliquéd detail, in a combination of check fabrics, is made from high quality, 100% cotton. 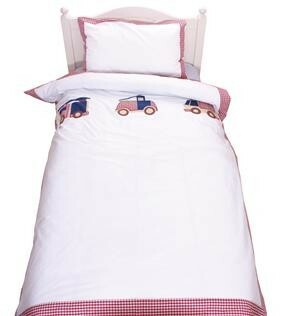 Available in single and junior sizes, this set includes a matching pillowcase. With it's red gingham border, our Fire Trucks duvet set co-ordinates beautifully with our navy gingham fitted sheet and our navy gingham curtains.